Former exes Selena Gomez and Justin Bieber have been meeting up several times in the past few weeks. On Friday they had yet another date as the 21-year-old Wizards Of Waverly Place actress went to a recording studio in Hollywood to join the troubled 20-year-old pop star. The brunette beauty did not disappoint as she dressed up in a very short summer romper to show off her slender pins for the rendezvous. Selena's spring outfit included the white flowing but short number adorned with pink roses that exposed her back, which she covered up with a baggy cream cardigan. She teamed the ensemble with a grey lace-up platform sandals and a Coachella-inspired brown hat over her flowing brown locks. The Come And Get It singer enhanced her natural beauty with simple makeup and wore a long necklace around down the front of her dress. Bieber was not photographed, but was spotted at the studio earlier in the day. Along the way to meet up with her beau, the former child star stopped for a frozen drink which she carried in her hand while juggling her cell phone. Selena has been exhibiting some erratic behavior lately as she abruptly fired her parents as her managers and enlisted the services of Katy Perry's powerhouse manager Bradford Cobb. Her parents were said to be 'vehemently opposed' to the reunion. According to RadarOnline, the Come & Get It hit-maker's mother and stepfather believed the couple's break-up was the catalyst for her recent rehab stint. However, they have a limited say in Selena's life, with the source adding: 'They don’t have any control over her. Selena reportedly got cozy with Justin while attending the Coachella Music Festival two weeks ago. It seems that the stumbling block in these failed friendships is also over Justin Bieber. Taylor is widely reported to have given Selena a him-or-me ultimatum - and it seems the starlet chose Justin. Meanwhile, a source told MailOnline that Selena pulled Kendall and Kylie from her social media account after they 'spent time' with her on-off beau. Meanwhile her paramour is now in New York where he shared a cryptic Instagram post on Saturday hinting at making a marriage commitment - be it to the songstress or to somebody else. 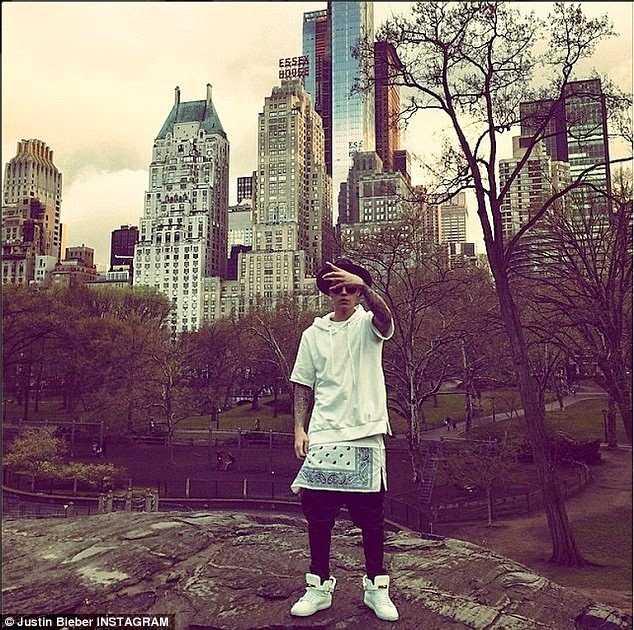 He announced to his fans and followers that Central Park was the place he had originally planned to 'propose to his future wife' as he struck a pose in the popular New York City nature spot on Saturday.